A classic martini at Vernick. There's no polite way to say it, but as far as plenty of bartenders are concerned, James Bond drinks his martinis all wrong. True connoisseurs will tell you the drinks are to be stirred, never shaken — and what Bond orders isn't even a martini, at least not in any traditional sense. 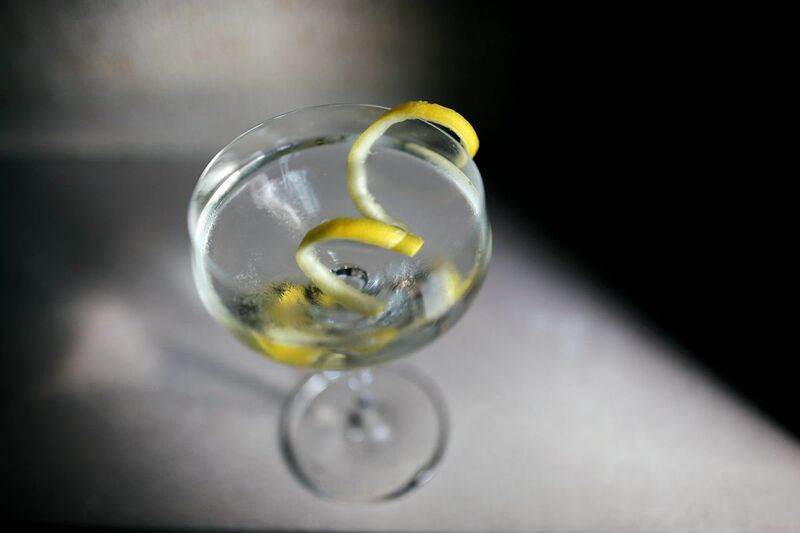 To fully grasp the extent of Bond's faux pas, one must know that most experts say a martini is made only of gin, vermouth, perhaps a dash of bitters, and a twist of lemon. Not vodka, not olive brine, not coffee, or pomegranate or lychees or apple liqueur, despite what some menus would have you believe. Bond's "shaken, not stirred" order is one reason the martini, one of the world's most enduring cocktails, is also one of the most misunderstood. "It's been reinterpreted and misinterpreted so many times," said Paul MacDonald, head bartender at Rittenhouse's Friday Saturday Sunday. "It's a word that has been stretched so far beyond its original meaning that it almost doesn't mean anything anymore." The roots of the martini can be traced to the 1860s; some say it originated in Italy, with the Martini brand of vermouth, but others believe it came from Martinez, Calif., where a similar cocktail emerged that some bartenders liken to a cross between a Manhattan and a martini. When Prohibition was lifted in 1933, the market was flooded with gin and vodka, both relatively easy to manufacture, and martinis rose to prominence. Beverage manager JB Bernstein adds a twist of lemon as he makes a classic martini at Vernick. To JB Bernstein, beverage manager at Vernick, a perfect martini is made from Plymouth Gin, a smooth spirit that lends itself well to those who find gin's juniper flavor unpalatable. Bernstein's drink includes Dolin, a French dry vermouth, as well as a touch of Lo-Fi Aperitifs dry vermouth to add a touch of sweetness; he encouraged at-home bartenders to experiment to find the ratios that taste best. A few dashes of orange bitters season the drink, then it's stirred in a glass of ice, gently. Like many martini experts, Bernstein believes the drink should always be stirred to preserve the texture. Shaking, he said, is a violent act that slams bubbles of air into a liquid that should stay cool and silky. A martini is best strained into a glass and garnished with a twist of lemon that is first squeezed over the cocktail, allowing the oils to settle on the glassy surface of the drink. The resulting martini smells as fresh and clean as a glass of lemonade, a citrus flavor that dissipates when the gin hits the tongue. Colin O’Neill pours gin to make the house martini at Oyster House in Center City. The house martini at the Oyster House on Sansom Street is Plymouth Gin mixed with a from-scratch vermouth that evokes chamomile, honey, tarragon, and mint. For a cocktail with a more verdant flavor than can be made with store-bought ingredients, bar manager Colin O'Neill suggested a martini with Barr Hill Gin, made with honey from farm-raised bees in Vermont. The drink is mixed with Noilly Prat dry vermouth and strained into a glass whose edge has been lightly coated with a lemon rind. To hit that cold sweet spot, bartenders recommend using chilled glasses rather than keeping gin in the freezer. "Over-chilling a spirit masks its taste," O'Neill said. "You want it to taste like smooth velvet. If it's too cold, it tastes tinny in a way." Some believe martinis should have barely the ghost of a taste of vermouth — which is often what people mean by "dry." But many now believe the shift toward dry martinis was born out of the chronic mistreatment of vermouth, a fortified wine that goes sour if left out on a shelf. Stored in a refrigerator, vermouth can be preserved for about three months; experts advise those mixing drinks at home to buy small bottles. As martinis gained popularity, bartenders created riffs like the Gibson. Old City's Royal Boucherie currently pours a variation on that classic cocktail, a bitters-free version of a dry martini made with a pearl onion pickled in champagne vinegar and herbs. MacDonald recently added a take on another drink in the martini family to Friday Saturday Sunday's menu; called a Cheap Suit, it's made with Cocchi Americano, an aperitif made bitter with quinine, then added to a lemon-coriander shrub for a bright taste reminiscent of Lillet. It's based on a Tuxedo, a drink that traditionally includes absinthe. Expert bartender and martini enthusiast Paul MacDonald’s sherry martini at Friday Saturday Sunday. For those interested in experimenting with martini derivatives, MacDonald suggested replacing vermouth with Manzanilla sherry and blending with a strong dry gin, like Beefeater. The Manzanilla, a dry sherry, has a flavor faintly evocative of chamomile, and it brings a briny tang to the gin. Many believe the vodka martini, particularly when enhanced with the salty flavor of olives, developed as an alternative for those leery of gin. Barclay Prime bartender Alenrry Iniguez doesn't even bother adding vermouth when asked to make one: "Usually the brine will completely eat it up." He uses Belvedere vodka and brine, and serves it with two olives. Extreme dirty martini enthusiasts can add viscosity with a tiny drop or two of olive oil, he said. Barclay Prime bartender Alenrry Iniguez makes a vodka martini. Over time, martinis became associated with the triangular shape of the glass they are served in, rather than the ingredients, and endless permutations of flavored cocktails were born. "People will come to the bar and ask to see a martini list," Iniguez said. "There's no such thing!" MacDonald, for his part, finds himself fielding a surprising number of orders for espresso martinis. Unlike traditional martinis, MacDonald said, those should be shaken to create a frothy foam head. "To be clear, it's not a martini," he said. "But people love them." An espressotini at Friday Saturday Sunday. As it's not an official drink, there are no rules. MacDonald makes his with Boardroom Spirits vodka, aged Guatemalan rum, La Colombe coffee, amaro, and a hint of salt. In Ian Fleming's novels, Bond drank a Vesper cocktail, made with gin, vodka, and vermouth. In later novels and the movies, Bond ordered both gin and vodka martinis, often served shaken. The problem with shaking a martini, Iniguez said, is that in addition to impacting the drink's taste and texture, the air bubbles forced into the liquid make it murky. "If you want it really cold, and you don't care about the appearance, you don't mind if it's cloudy, then you want it shaken," he said. "But if you want it to look like a beautiful jewel, you want it stirred. Really, even if James Bond says he wants it shaken, you want it stirred."